Here's what I'm looking forward to reading in March. Still Mine by Amy Stuart was on my reading list way back last June, but I never got around to giving it a try. It looks like a good mystery, so I'm looking forward to giving it a whirl. Children of God by Mary Doria Russell is the sequel to my favorite read of 2016- The Sparrow. I've had this copy for probably six months now, and finally decided it's time to give it a read. I'm not expecting the same magic of The Sparrow, but I'm looking forward to seeing where this book takes those characters. Burial Rites by Hannah Kent was given to me in a Books and Bloggers Swap with Jenni King. It takes place in Iceland, which is part of what drew me to it. Soul Shift by Steve Deneff is nonfiction book all about spiritual transformation. It details how we sabotage our efforts to change and how to shift your mindset. It's been on my shelf for a while, but I feel like I could really use it now. Have you read any of these? Or have a recommendation for me? Feel free to drop me a note in the comments letting me know. 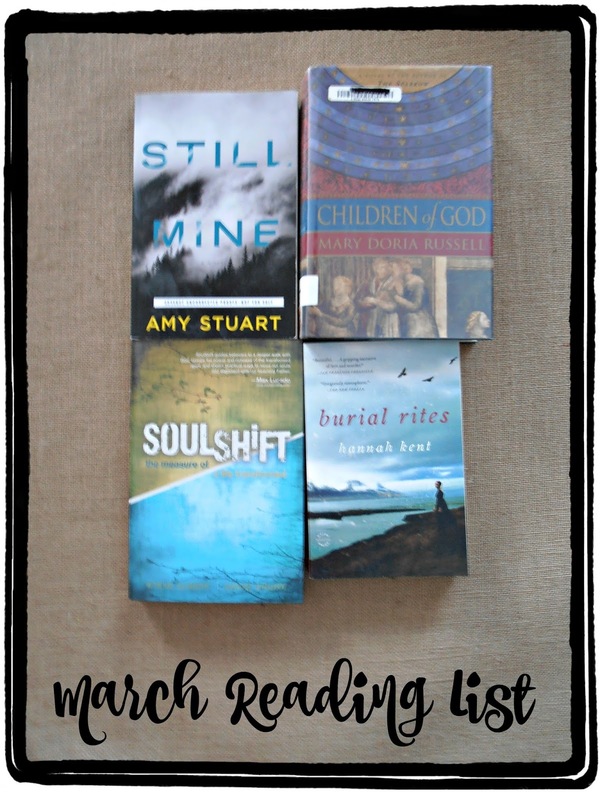 Burial Rites is also on my TBR! I probably won't get to it this month, though. :( However, in the days remaining in March, I hope to finish Wintersong by S. Jae-Jones and read The Thief by Stephanie Landsem and The Sign by Raymond Khoury.